Two of marketing professor Sanjay Mehta's classes conduct research and develop marketing plans for university departments and Huntsville businesses as part of Mehta's "service learning" effort. With Mehta above is Kerry Murray, SHSU Service Award recipient and owner of Murski's, with which Mehta's graduate-level class has worked in the past. —Photo by Brian Blalock. Serving the community appears in many different forms. For Sanjay Mehta, serving the Sam Houston State University campus and the city of Huntsville begins in the classroom. 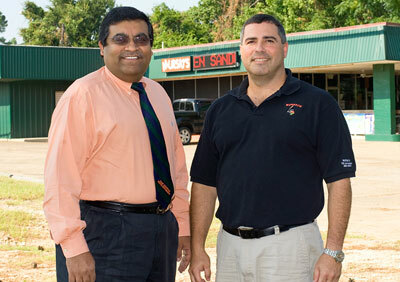 Mehta has been teaching marketing courses at SHSU for the past 13 years. During this time, he has been instrumental in connecting with the community, designing “Marketing Research” (MKT 472) and “Marketing Management” (MKT 570) courses to educate students and benefit the community. In Mehta’s marketing research course, students learn to serve the SHSU community by providing solutions to real problems conducting secondary research, developing hypotheses, creating a questionnaire, collecting and analyzing data from the target market and making recommendations to clients on campus. Since developing this pedagogy at another institution over more than 20 years ago, Mehta has done projects for the university libraries, the University Police Department, the College of Business Administration, the University Hotel and the SHSU Alumni Associations, among others. “The biggest difference between Marketing 472 and the other courses I've taken was the material,” said Meghan Burton, a student in the Master of Business Administration program who has taken both Marketing 472 and Marketing 570. “Although other courses touched on the necessity and uses of research, Marketing 472 was the only course of which research was the focus,” Burton said. “Through that course, I found that I enjoy research and may decide to pursue it as a career. We created a survey and conducted an observational research project. “These projects made the course material more relevant than had we just read it in the textbook without actually experiencing the process, which enriched my learning experience,” she said. Marketing 570, the graduate-level course, takes a similar approach by applying similar techniques to the businesses in the Huntsville community. By partnering with SHSU’s Small Business Development Center, the class is divided up into competing groups responsible for developing marketing plans to present to the selected business owner. After the business owner has been selected, he or she comes to the classroom and spends several hours discussing the current needs and history of the business with the students. A representative of the SBDC also attends to discuss procedures and rules, before nondisclosure agreements are signed between the owner and students. The students then split up into teams and compete to develop the best marketing plan. The business owner, Mehta and other faculty members judge them for their input and creativity. “It really challenges the students, as they are competing against each other, and also because they are required to develop a marketing plan using a limited budget provided by the owner,” Mehta said. Of the 60-70 businesses that the classes have worked with over the years, roughly 90 percent are still in business today, according to Mehta. Mehta also has benefited from the courses, as it provides him with ample data he collects to write academic articles and case studies. He has published numerous articles over the years. “Sometimes we just need to take a look around us and see the needs of the community. Not everything in life is about money,” Mehta said. Mehta works very closely with a group of faculty members who are trying to get other SHSU faculty members involved in offering Academic Civic Engagement courses. ACE courses teach students the significance of community service. Currently, the group is working on acquiring the Carnegie Classification for Civic Engagement. For more information about ACE courses, contact the Professional Academic Center for Excellence at 936.294.2688. Please send comments, corrections, news tips to Today@Sam.edu.